Before Michael J. Fox was brought on board Back to the Future, Eric Stoltz played Marty McFly. In the new book We Don't Need Roads: The Making of the Back to the Future Trilogy, the author details the circumstances of what lead to the Family Ties actor replacing Stoltz early in production. 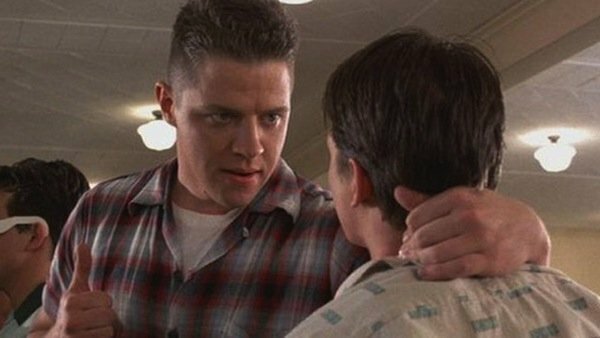 While Stoltz being let go primarily had to do with him not bringing the right type of energy to the film, his working relationship with Tom Wilson, who played antagonist Biff Tannen, didn’t help matters, and here was one scene in particular that emphasized the bad blood between them. Despite repeated requests from Wilson to take it easy, Stoltz didn't, forcing the heels of his hands into the supporting actor's collarbone with increasing strength. After several takes, the result was Wilson’s collarbone being heavily bruised. Wilson was already irritated by Stoltz’s method acting before (he wanted everyone on set to refer to him as Marty), but this encounter left Wilson bitter towards his costar. He didn’t want to complain about the incident to director Robert Zemeckis, but in his mind he was already plotting revenge. During the scene when Biff punches Marty at the Enchantment Under The Sea dance, he planned to deliver the same "method" treatment that Stoltz dished out. Unfortunately for Wilson, he never got the chance to retaliate because Fox arrived not long after. It probably wouldn’t have been a good idea to full-on punch someone you don’t have a beef with. Although the footage of Stoltz and Wilson’s cafeteria scene hasn’t been made public, you can see the film’s final version between Marty and Biff below. Although Stoltz being replaced was a big deal (especially considering that they had to reshoot everything filmed to that point), it wasn’t entirely surprising to many of the cast and crew of the time travel classic. Wilson apparently felt an uncomfortable atmosphere on set in the weeks leading to the announcement. It’s hard to picture anyone other than Fox playing foil to Wilson in Back to the Future and its sequels, but had Stoltz somehow stayed on for the whole series, I imagine the animosity between Marty and Biff (and the other Tannen family members for that member) would have existed in real life as well.